Disclaimer : I'm an idiot, be gentle. Right, so, I finally got round to getting myself a wireless router (router was added to my vocabulary by the lovely man in shop who insisted that wireless thingy machine was not the correct term for the device) and I thought that I was a technical genius in managing to install it all by myself. It seems that there's some kind of occasional limit on my bandwidth, ie. the likes of youtube doesn't load in full, if at all, and it's a near impossible task to download anything. I've been advised that this is probably because my wireless connection is not secure and I'm allowing folk to steal MY internet. This is rather ironic seeing as I'd oft resorted to stealing my neighbours' internet. Now, I'm a generous soul, and would have no problem with sharing my internet were it not for the aforementioned problems, and so, I was wondering if anyone here could point me in the right direction as regards securing my wireless thingymajig. tl;dr How do I set a password for access to my wireless? CaraInFrames: It will be helpful if you post the brand and model of your router. They have different screen setups where you put the various settings. In my experience, the manufacturer's website frequently has good tutorials about things like security configuration. That is where I would start. Ok, I shall go find out who my wireless machine is, do a little research, and return with my findings. If the problem started right after you installed the router, it may not be others using your connection. It may just be in a bad location. Make sure to put it at least a few inches from any other electrical device (monitor, printer, tower, ect. ), especially wireless devices. Also elevating the router can help. If you don't know where to begin, your router's setup menu is probably located at 192.168.0.1[might also be 192.168.0.0] (type that in the address bar). Mine has a tab called "Security" that allows for WEP/WPA/etc. setup. TheTankengine wrote: If you don't know where to begin, your router's setup menu is probably located at 192.168.0.1[might also be 192.168.0.0] (type that in the address bar). Mine has a tab called "Security" that allows for WEP/WPA/etc. setup. Try also 192.168.1.1 if those don't work. I'm going to take a wild guess that it's not because other people are stealing your bandwidth. I've got two wireless networks in my house (that somehow don't interfere with each other), one is secure, the other is not. My secured network has that happen more often than the insecure one does. It's probably just a poor signal, resulting in really slow communication. Best way to fix that would be to try moving it somewhere where nothing is interfering with the signal. Ok, I've still not actually gone to investigate the router model...I'm avoiding the living room at the moment...but if I use a cable from the router to connect I have the same bandwidth restrictions so wouldn't that indicate that it's not a signal issue? 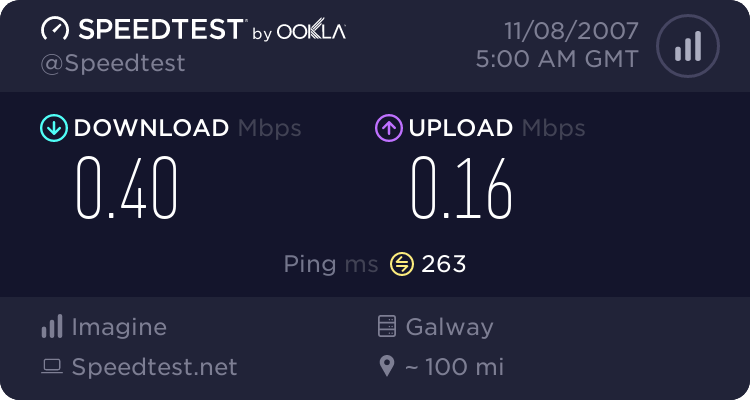 CaraInFrames wrote: Ok, I've still not actually gone to investigate the router model...I'm avoiding the living room at the moment...but if I use a cable from the router to connect I have the same bandwidth restrictions so wouldn't that indicate that it's not a signal issue? Indeed it would. What if you bypass the router completely? Then I have no such problems at all. But then I've no wireless at all, either. CaraInFrames wrote: Then I have no such problems at all. But then I've no wireless at all, either. Well obviously no wireless, just wanted to make sure the router was the problem. There should be a recessed reset button on the router, try holding that down for thirty seconds, then go through the setup. Like someone mentioned above, there should be an online document on the manufactures website on basic setup. it is also possible that your ISP is throttling certain types of traffic (possibly at certian times of day) iirc there are certainly some that throttle bit torrent traffic and i wouldnt be surprised if youtube was throttled by some. as for security. go for wpa or wpa 2 if you have it available over wep but anything is better than nothing. i'd recommend copying your secure key to a portable device or to everything on the network before you start, especially if its long and contains a wide selection of characters like it should (iirc wpa max strength would be a 63 char key). you will need to find out how to configure your router, often this is done through your web browser, consult your documentation. This will give an idea about how much traffic you're actually getting. Are you using DSL or Cable? If you want to set up security, I can help you step by step with that. But answer the above please. With my experience with routers, and internet, the most likely issue is indeed your ISP throttling your connection. 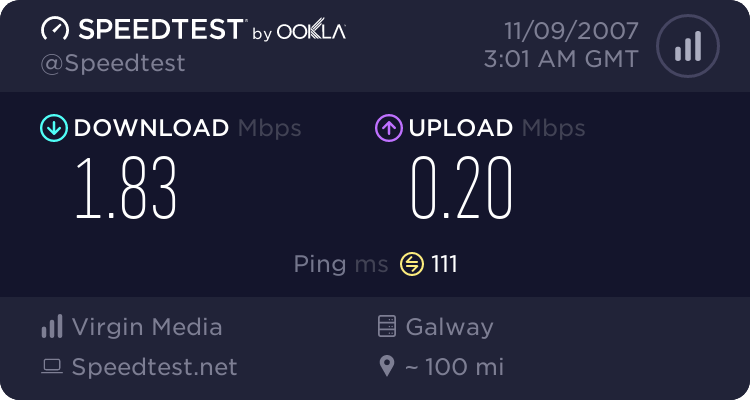 However, If youtube isn't loading all the way I don't believe they're throttling your connection, and it's actually a bad service of ISP. You may need to switch. But again i still highly doubt all of this. If you are using cable, I've had many problems alone with just bad wiring (literally a guy needs to come by and do physical work on it because they're bad). Again post back all the info i asked for so I can give you an idea what's up. Hmmm, I encounter none of these issues when I'm just not using wireless.wouldn't that the isp off the hook? Anway, thanks to you all so much for paying so much attention to my petty woe, everything. and for, largely, not terrifying with me with jargon. Wait when you did the test was it on direct wiring? or WiFi? Dark Ragnarok wrote: Wait when you did the test was it on direct wiring? or WiFi? You have a mac so I don't know the path to get there. But try to access you're wireless properties so that it will tell you Your IP address on the network, and all those things. If i remember right you go to wireless icon on your taskbar and select properties from there. But i don't know how to do it on a mac. In any case one of the properties should be "Gateway Address" and that number should be the router's IP address. Input it and go to the page. If it prompts for a password usually its User: "[blank]" or "admin" password: "admin" or "1234". Unless you already changed it yourself, but if you didn't try the admin/admin combo first. The page you see should display different settings. One of them should be something like "wireless security" and such. When you find it, it gives you options for different types of encryptions for your WiFi. WEP is good. But unless you haeva great memory it's not an easy one to remember so usually tou need to manually write it down and type it back in. So I use WPA. You type in any 8 digit password and that will encrypt your WiFi. To make the encryption more secure, you can insert capital letters, numbers, symbols, and whatnot. I think if you do a good job on that you're WAY more secure then using a 128 bit WEP encryption. I've broken through those, and the reason they're a little easier to decrypt is because it's a set "password" by the computer that follows a pattern (more or less). When you complicate your password on WPA versus WEP, I think it discourages hackers to try and break through an easier encryptions. Anyways, set your PW, and *re log* onto you're wifi network. By setting a password you'll be kicked off the connection. So go back, log on, type in the PW, and you're done. If i made that too complicated, ask anything you need to so i can try and simplify it. You absolute angel, it's all beautifully secured now, Thank you so much! I'm using a Belkin router now, so I'll actually look at the set up page you'll be using. Make sure you change the password: the default is blank. This is under 'System Settings', probably the very last item on the list on left. The router's set-up up page should have a list of devices that have connected to the router since it was last reset (listed as DHCP Client List). This will let you know if anyone else is using the wireless. If you've plugged into the router with a cable, your computer will have two listings. It will also give you your MAC address, which is a unique (or nearly, I'm not sure on the details) number given to each peice of networking equipment. If you want, you can copy/paste this into a text editor, remove the colons, then paste it on 'MAC address filtering', check the 'Enable MAC Address Filtering' box, and save changes. It's a long way off perfect, as MAC addresses can be changed or spoofed, but it worked well enough for me when I had housemates and didn't want to try setting up WEP on their computers. It gets awkward if you need to add computers often, but if you only plan on using your own, then it shouldn't be a problem. Under 'Channel and SSID' there is an option to Broadcast SSID, which is on by default. Changing the SSID and then turning broadcast off is also good if your computer connects automagically - it makes it more difficult for people to find that there's a network to break into. Of course, if you can steal your neighbours' internet easily, then this increases your security - why break a window in your house if next door's front door is wide open? Well I already pay for my own internet so I'd like to use it at full capacity, and my stolen option isn't the more reliable access, anyway. If i recall.... as long as no one get *on* the network they can't even get to the PW page. So... it's only meant for people inside the network. So unless you;re very afraid of hackers. Of have a spouse/smart kid around. You're fine. Anyways let me know if youtube is still an issue or not. I'm still trying to help you max out your bandwidth. I've not tried d'loading anything as of yet but the youtube issue seems to be no more. Again, thanks for the patience, I've had some scary experiences with having to admit my sheer ignorance in the face of technology. CaraInFrames wrote: Well I already pay for my own internet so I'd like to use it at full capacity, and my stolen option isn't the more reliable access, anyway. What I mean is, if some-one's sat outside trying to steal internet, if you have very little/very poor security, it's likely to be enough if your neighbour has none. Of course that's what you meant, apologies, analogies tend to fly over my pretty little head most of the time. The temporary slowdown may be because of a firewall on the router itself. Because you're on a mac you don't need it, so if it's there turn it off. Usually through a set-up disc or the web-browser thing. Unless its not. Sometimes it says on the box if there's a firewall. So long as it's sticky and goes well with a taco. I am facing the same issue which I am not able to solve by any method, the problem I am facing is that I am not able to visit few sites like Youtube, Hotmail, Mobdro, etc.